Canmore – Herbertshire Brick Works, Millstone Grit and Fireclay Ltd, Denny. Below – Source Falkirk Museum and Archives. – Herbertshire Brick Works, 16 Sutherland Drive, Denny. Established prior to 1922. 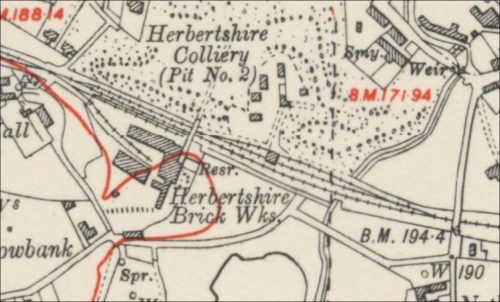 The Herbertshire works changed hands several times, Callendar Coal Company which later became the Callendar Brick and Fireclay Company and Cannerton Brick Works being previous owners. In 1968 The Millstone Grit and Fireclay Company bought the Works. The latter consisted of James McCaig Senior and James McCaig Junior and Mr James Pitman. The site had a Mitchell plastic brick making machine. 1 Hoffman circular kiln which was converted to a Belgian Kiln with a firing temp of 1300c. It had 18 chambers. It also at one stage had a tunnel kiln with 90 cars and a firing temp of 1350c. The works made common bricks made from pit blaes obtained from the Herbertshire Colliery. Fireclay was obtained from Slamannan. The works were connected to 3 mines but most material was obtained from Theap Rig Colliery. The Company originally had a siding off Greenhill but this stopped in the 1960’s. The Company had 1 lorry and hired lorries from Walker Brothers, Cowdenbeath. They exported to Sweden, Germany and the Philippines. When Millstone Grit and Fireclay Company took over in 1968 there were 28 employees consisting of 3 setters, 4 trimmers, 1 hand moulder, 1 engineer, 1 brick layer and 1 electrician. The works originally produced castables, common bricks, high alumina refractories, mouldables, pipes and tiles and when Millstone Grit and Fireclay Company took over they produced Cuppilla (Crown), Cups, Firebricks, Pups (soaps), Scones (splits), side arches, squares, wedges and whelps. 10/02/1900 – Falkirk Herald – Wanted – Panman (steady) accustomed to mill clay for pipe making – Herbertshire Brick Works, Denny. 26/03/1901 – Dundee Evening Telegraph – Serious accident at brickworks – This morning a most serious accident befell a girl named Jemima Mackie, aged 15 year, employed at the Herbertshire Brick Works, Denny. When engaged working a tile machine her left arm got caught, fracturing the humerus bone, and mangling the arm so severely that it feared amputation will be necessary. She was removed the Cottage Hospital. 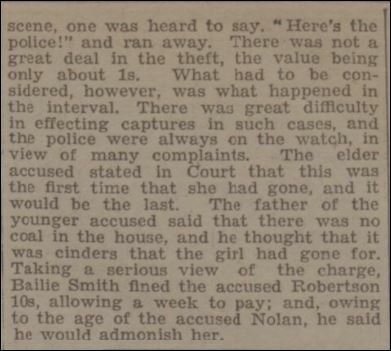 27/04/1907 – Falkirk Herald – Wanted, Contractors to empty Hoffman Kilns. Also a few good labourers – Herbertshire Brick Works, Denny. 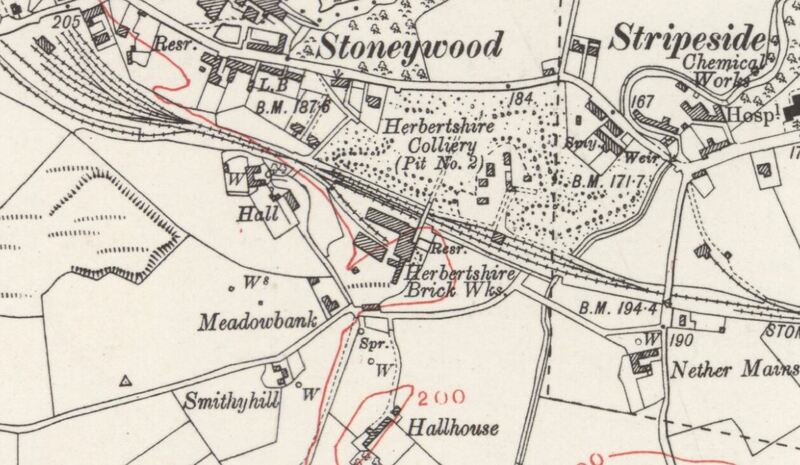 01/07/1911 – Falkirk Herald – Reference to labourers being charged with sleeping at the Herbertshire brickworks. The article details that the works were then owned by the Callendar Coal Company. 30/07/1932 – Falkirk Herald – Denny and Dunipace Town Council meeting …correspondence was read which had passed between Dr Adam, medical officer of health and the Callendar Coal Company, proprietors of the Herbertshire Brick Works with reference to the recent complaint of the alleged emission of black smoke which was troubling the householders at the Herbertshire Park site. The brickworks proprietors initimated they were adopting different fuel which it was hoped would prevent a recurrence. 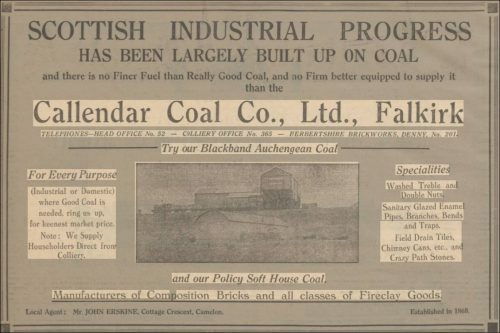 Below – 28/12/1935 – Falkirk Herald – Callendar Coal advert with reference to Herbertshire brickworks. 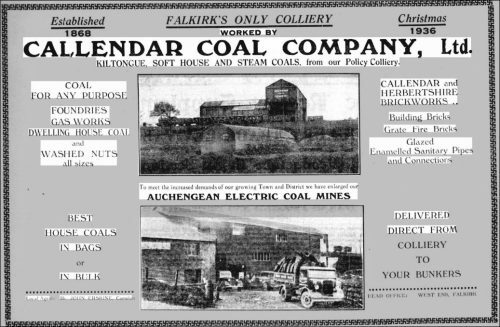 Below – 28/12/1935 – Falkirk Herald – Article on the Callender Coal Company with reference to the Herbertshire brickworks. 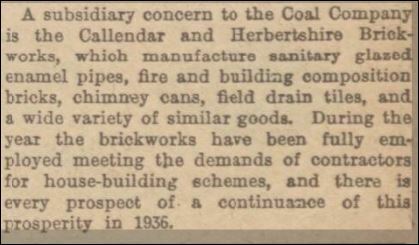 Below – 26/12/1936 – Falkirk Herald – Callendar Coal advert with reference to Herbertshire brickworks. 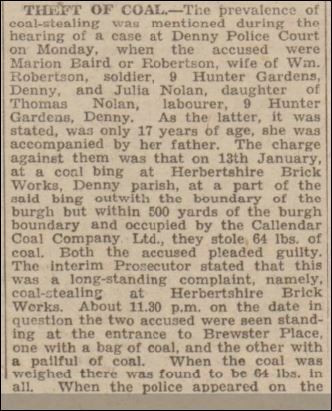 Below – 04/02/1942 – Falkirk Herald – Theft of coal. 11/09/1943 – Falkirk Herald – A demonstration of anti-personnel bombs will be given at the Herbertshire Brick Works tomorrow ( Sunday) 12th September at 3pm and on Tues 14th Sept at 7pm. All members of the fire fighting groups, WVS, and Housewives Section are requested to attend. 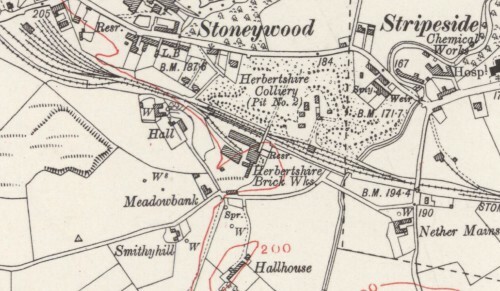 Below – 1946 – Herbertshire brickworks, Denny. 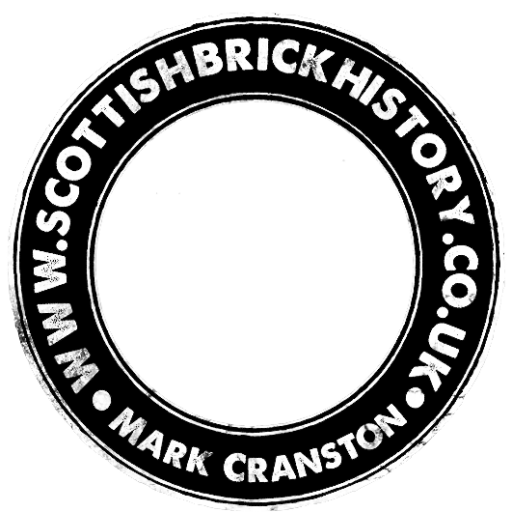 01/05/1948 – Falkirk Herald – Experienced brickworks foreman required for Herbertshire brick works, Denny. Apply Callendar Brick and Fireclay Co Ltd, Glen Brickworks, Falkirk. Below – 11/12/1948 – Falkirk Herald – No washing facilities at Denny brickworks. 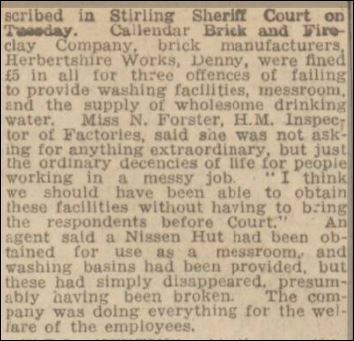 A Denny brickworks with no washing facilities or messroom, where 35 workmen had to shelter in half-empty kilns and near the boiler for warmth during their luncheon break, and drink water from a spring which the Water Board later refused to approve, was described in Stirling Sheriff Court on Tuesday. Callendar Brick and Fireclay Company, brick manufacturers, Herbertshire Works, Denny, were fined £5 in all for three offences of failing to provide washing facilities, messroom and the supply of wholesome drinking water. Miss N, Forster, H.M. Inspector of Factories, said she was not asking for anything extraordinary, but just the ordinary decencies of life for people working in a messy job. ” I think we should have been able to obtain these facilities without having to bring the respondents before Court.” An agent said a Nissen Hut had been obtained for use messroom, and washing basins had been provided, but these had simply disappeared, presumably having been broken. The company was doing everything for the welfare of the employees. 06/08/1949 – Falkirk Herald – Wanted, 3 experienced burners for Hoffman kilns – Apply Callendar Brick and Fireclay Co Ltd, Herbertshire Brickworks, Denny. 13/08/1949 – Falkirk Herald – Wanted , 2 experienced mixers for brick machine, also 6 women for brickworks. Apply Herbertshire Brickworks, Denny. 20/05/1950 – Falkirk Herald – For sale, Nissen hut, 52ft x 18ft, double lined in perfect condition, been used as a canteen, can be seen at Herbertshire Brick Works, Denny. Arrangements may be made with the Company to rent ground where it sits. Apply J. Gillies, South Garngrew, Castlecary. 20/02/1954 – Falkirk Herald – Obituary – Mr James Haugh Sen, Uinon Terrace, a man well over 80 years , who spent a considerable part of his lifetime in the management of the Herbertshire Brickworks. 26/02/1955 – Falkirk Herald – Article on falkirk industry …..Coal and iron however did not represent the limit of the mineral wealth of the district for on the South side it was discovered that fire clay and ganister abounded. Thus midway through the last century the manufacture of refractory bricks became another major industry in the town. The brickwork in Denny exists today and the quality of the product is world renowned – there must be few furnaces of fire places in factories or dwellings or even afloat anywhere in the world that do not contain brick made from the clay of the Denny district.